With my whole heart I cry; answer me, O Lord . . . I rise before dawn and cry for help; I hope in thy words. My eyes are awake before the watches of the night, that I may meditate upon thy promise. Hear my voice in thy steadfast love; O Lord, in thy justice preserve my life. 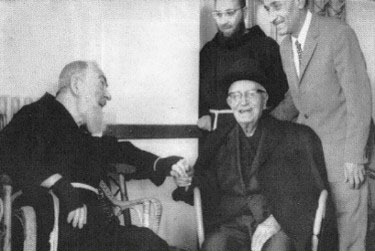 Padre Pio and his life-long friend, Dr. Andrea Cardone at the time of their last visit. the stigmata on Padre Pio’s hands before they became permanent. In 1918, when Padre Pio was thirty-one years old, the wounds became permanent. Dr. Cardone also examined Padre Pio’s stigmata after it became permanent and left a written statement regarding it. He wrote that the wounds “pierced the palms of his hands completely through, so much so that one could see light through them.” Shortly after obtaining his license to practice medicine, Dr. Andrea Cardone of Pietrelcina became the family doctor for Francesco Forgione (Padre Pio) as well as the entire Forgione family. In the early days, Dr. Cardone had no idea of the worldwide fame that Francesco would one day receive. Dr. Cardone remembered that as a boy, Francesco would go to the parish church in Pietrelcina every day. Dr. Cardone sometimes watched young Francesco as he climbed the stairs that led to the church. Even before entering the church, Francesco was already recollected in prayer. He always kept his eyes lowered when he walked through the streets of Pietrelcina on his way to school. Some of the local children were without parental supervision and frequently used bad language. Dr. Cardone remembered that little Francesco would cry whenever he heard their profanities and would run away. When Padre Pio was a young Capuchin monk in Pietrelcina, Dr. Cardone treated him for his many ailments. Often, Dr. Cardone was at a loss as to how to help him. Padre Pio had a chronic cough and was extremely thin. Many people in the town believed that he had tuberculosis. For this reason, some people avoided him, thinking that his condition was contagious. Dr. Cardone tested him on numerous occasions and was relieved to find out that he did not have tuberculosis. He accompanied Padre Pio to Naples in order to consult with Dr. Castellino, the leading physician of that time. But no matter what remedies were given, Francesco’s health did not improve. His frequent fevers too, were mysterious. Dr. Cardone confided to a friend that he believed that his fevers were of a supernatural origin. Dr. Cardone remembered that just before Easter, Padre Pio used to gather the youth of Pietrelcina together at his home. He instructed them in the Mass readings of Good Friday and taught them the songs to be sung at intervals between the Passion prayers. Through the years, Dr. Cardone always felt the beautiful impression of Padre Pio’s goodness, his sweetness, his superhuman modesty, and his many other virtues. Like a number of the other citizens of Pietrelcina, Dr. Cardone said that he felt honored to have Padre Pio as a personal friend. He also felt it a great privilege to be his doctor. “We of Pietrelcina are proud of the divine grace which works through Padre Pio and spreads so much good throughout the world,” Dr. Cardone said. Padre Pio found many ways to improve the lives of his fellow townsmen in Pietrelcina. A large number of the citizens who lived there had never had an opportunity to get an education. It was not unusual to see Padre Pio out in the fields with the local farmers and day laborers, instructing them in basic reading and writing. He also taught mathematics to the local people. He organized wholesome games for the citizens to participate in and directed a boys’ choir at the parish. Padre Pio had only been a priest for several years when a local farmer of Pietrelcina summoned him one day. Lice had infested the farmer’s crops and fruit trees and all seemed doomed for destruction. The farmer asked Padre Pio if he would be willing to go with him to his fields and bless them. Padre Pio agreed to do so. He made the sign of the cross over the man’s land and prayed fervently. Shortly after Padre Pio has blessed the crops, the farmer was amazed to see that the lice had all fallen to the ground. The word spread rapidly among the townspeople. The other farmers decided to ask Padre Pio to bless their land as well. That year the harvest in Pietrelcina proved to be excellent. When Padre Pio (Francesco Forgione) was a child growing up in Pietrelcina, he and his family lived in a very small house, number 32 on Vico Storte Valle (Crooked Valley Lane). It was a stone house with a reed ceiling, very much like all the other houses in the neighborhood. It was the house of poor people, who often struggled in order to survive. The well at Piana Romana is still standing today. Grazio was doubtful that Francesco’s words were true. “Son, why should I believe what you are telling me? How do I know that I will find water there?” “You will see,” Francesco replied. Grazio realized that he had nothing to lose, so he decided to follow his son’s advice. Soon water started gushing from the exact spot that Francesco had pointed to. “Son, how did you know that water was there?” Grazio asked. “Jesus told me,” Francesco said simply. 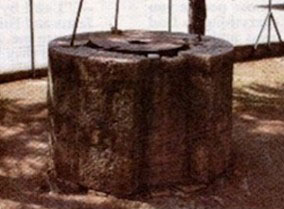 As time passed, the well continued to produce a steady and abundant supply of water, more than enough for the needs of the Forgione family. Countless people were inspired by the reverence and the intense devotion that Padre Pio exhibited whenever he celebrated Mass. He meditated deeply on every word of the Mass. He often shifted on his painful feet, and paused many times to pray in silence. At the Memento – the prayers for the living and the deceased – his voice sounded weary and strained. At times he trembled and wiped the tears from his eyes with a handkerchief. He once said that during the Mass the Lord allowed him to mystically see all of his spiritual children – those who were living as well as those who had already passed away. The mayor of San Giovanni Rotondo, Francesco Morcaldi, once asked Padre Pio to celebrate Mass in front of the town hall. When the local citizens as well as people from the surrounding areas heard that Padre Pio had accepted the mayor’s invitation, they were filled with enthusiasm. On the day of the Mass, huge numbers of people descended on the town. The square in front of the town hall as well as the adjacent streets were completely full. There was once a man from Turin, Italy who had a great desire to speak to Padre Pio. He wanted to seek Padre Pio’s advice on a personal matter that was of great importance to him. Every time he tried to plan a trip to San Giovanni Rotondo, his way was blocked. The man was finally able to visit Padre Pio but unfortunately the trip had come too late. “I am so happy that I could discuss my situation with you and receive your advice,” the man said to Padre Pio. “But I am sorry to say that time is against me. The information that I discussed with you needs to be received in Turin almost at this very moment. Even if I were to send a telegram, it would not make a difference now. The deadline has come,” the man said. “Don’t worry about the deadline,” Padre Pio replied. “Write a letter immediately and take it to the post office as fast as you can.” The man did what Padre Pio suggested even though he was convinced that it would do no good. Miraculously, the letter was received in Turin in a half-hour’s time. The postmark was clearly visible on the envelope. The letter had traveled a distance of more than six hundred and fifty miles in thirty minutes. The man was incredulous and also greatly relieved; the information had reached its destination on time. On one occasion, one of Padre Pio’s spiritual daughters wanted to give him a gift. After thinking about it for some time, she decided to give him two canaries. One day, with her bird cage in hand, she boarded a train to San Giovanni Rotondo so that she could present him with the unusual gift. When the woman arrived at the monastery door, she was greeted by the porter. The woman told him that the canaries were a gift for Padre Pio. “We are not allowed to keep anything for ourselves unless we have the permission of our superior,” the porter explained. “There is a strict rule in place regarding gifts of any kind.” “But couldn’t you please try to do something to help? I traveled a long distance by train in order to come here and I have a great desire to give Padre Pio these birds.” The porter then took the birdcage from the woman. He told her that he would let Padre Pio know about her gift. The porter then took the birds to his own cell temporarily. Soon he heard a knock at the door. To his great surprise, Padre Pio was standing there. “These birds just arrived,” the porter said. “A woman brought them for you and has a great desire that you receive them.” Padre Pio went over to the birds and for a few moments began to play with them. “Please do me a favor,” Padre Pio said to the porter. “Take the cage over to my cell. I would like to keep the birds for an hour or so.” The next day, the porter told the woman that Padre Pio had enjoyed the birds, even though he could not keep them. She was very happy to hear the news and very satisfied. Alfonso De Rosa was one of Padre Pio’s spiritual sons. One day, he had the overwhelming urge to see Padre Pio. He could not stop thinking about it. Alfonso decided to make the journey to San Giovanni Rotondo. He felt blessed that he was able to attend Padre Pio’s early morning Mass. After the Mass, he asked the Father Guardian if he could visit Padre Pio in his cell but he was denied permission. Alfonso went back into the church to pray. Sometime later that day, he spoke to the Father Guardian again. For a second time, he asked if it would be possible for him to speak to Padre Pio and for a second time the Father Guardian said no. Alfonso was very disappointed. He returned to the church once again to pray. He tried to resign himself to the fact that he would not be able to speak to Padre Pio that day. He had done all he could but he had not been able to change the Father Guardian’s mind. While he was sitting quietly in the church, a stranger approached him. “Are you the man who has a great desire to see Padre Pio today?” the stranger asked. Alfonso replied that indeed he was. “Follow me then,” the man said. The man led Alfonso to the sacristy of the church. Alfonso was very surprised to see that the gate near the sacristy was unlocked. He proceeded to follow the man through the gate. The door which led to the monks’ private quarters was also unlocked. The man opened the door nonchalantly and motioned for Alfonso to follow him. They then entered the corridor that led to the Capuchins’ cells. At that point, the stranger disappeared from Alfonso’s view. Alfonso simply could not figure out where he had gone. He was there one moment and gone the next. Two Capuchins who were standing in the corridor looked surprised when they noticed Alfonso’s presence. Alfonso knew that they would probably demand that he leave the area at once. He could not allow that to happen. He ran the rest of the way down the corridor to Padre Pio’s cell. Padre Pio was standing at the door of his cell, saying goodbye to several American priests who were taking their leave. Padre Pio then saw Alfonso. He welcomed him lovingly and gave hima blessing. It was what Alfonso had been hoping and praying for all day. Alfonso’s joy was so great that he could not contain himself. Unashamedly, he began to cry. overactive imaginations. He remained skeptical about Padre Pio. After a time, the discussions that Michael heard about Padre Pio began to arouse his curiosity. In June 1950, he decided to take his wife and his one year old son, Gianfranco, to visit Padre Pio’s monastery in San Giovanni Rotondo. He wanted to find out for himself the truth about Padre Pio. Michael found a hotel for his family about one-half mile from the monastery. The next morning, when Michael and his family arrived at the church for Mass, Padre Pio was already at the altar. When the Mass began, Michael had a chance to look at him closely. “He looks just like any other Capuchin,” Michael said to himself. Michael saw nothing singular or special about him. But as the Mass progressed, Michael witnessed something extraordinary. As the congregation prayed the Our Father, Michael noticed that the palms of Padre Pio=s hands were shining. The wounds in the middle of his hands were a very bright red, a brilliant red. The brightness dazzled Michael’s eyes. He shut his eyes momentarily and then opened them. He looked at Padre Pio’s hands once again. He wanted to make sure that what he had seen was not an hallucination. He knew that it was not. The light from Padre Pio’s hands continued to shine with great intensity. It was as if Padre Pio’s wounded hands were illuminated by a thousand electric lights. Michael lowered his eyes and then knelt down. He felt completely confused by what he had witnessed. The next day, Michael took little Gianfranco with him to the monastery. He was walking down one of the corridors when, much to his great surprise, he happened to see Padre Pio. With little Gianfranco in his arms, Michael greeted Padre Pio and asked him to give his young son a blessing. “Please pray for my little son so that he may someday become a missionary,” Michael said. “But why a missionary?” Padre Pio asked. “Let him be what God wills him to be.” He then placed his hand on the head of Gianfranco and blessed him. He gave Michael a blessing as well. He spoke to Michael about the nearby shrine in Monte Sant’ Angelo which was dedicated to St. Michael the Archangel. He encouraged him to take his family there for a visit. Every morning at the monastery, Michael went to the sacristy before Mass and waited for Padre Pio. He helped Padre Pio put on his priestly vestments before Mass. When Padre Pio returned to the sacristy after celebrating Mass, Michael was there to assist him. He and his family were able to spend more than a week in San Giovanni Rotondo. Michael had come as a skeptic. He left as a believer. the very moment she was thinking about his hands and wishing that she could see them, Padre Pio slowly pulled up one of his gloves so that his entire hand was exposed. Teresita noticed that his hand was very white and smooth. In the center of his palm was a large crust of clotted blood which reached almost to his fingers. After a moment, he slowly pulled the glove back down over his hand. Teresita made her confession to Padre Pio and before she left the confessional, she kissed his hand. She became instantly aware of a strong smell of carbolic acid. After she left the confessional, it lingered in the air around her for several hours. When she returned to her home, she could not get the thought of Padre Pio out of her mind. She kept thinking about the intensity of his dark and piercing eyes and the terrible wounds in his hands. Several weeks later, Teresita was on a train trip to the city of Lugano in southern Switzerland. As she passed through a mountainous region, she looked out the window and saw the town that she had grown up in. A feeling of homesickness swept over her. Her heart was aching as she thought of her dear family. Precious memories of days gone by flooded her mind. Suddenly, she noticed the same smell of carbolic acid that she had perceived when she kissed Padre Pio’s hand in the confessional. She knew then that Padre Pio was near and was aware of her sadness. Not long after, Teresita traveled to San Giovanni Rotondo again. She attended the early morning Mass and afterward she waited in the corridor in order to greet Padre Pio. For some reason, when Padre Pio stepped into the corridor, he looked altogether different from the way he had looked when he was at the altar that morning. He seemed to be much taller. He looked luminous and majestic. As he passed down the corridor, he left a trail of perfume behind him. On another visit to San Giovanni Rotondo, Teresita obtained a ticket for Padre Pio’s confessional. She waited three weeks but still her name was not called. Finally, having a family commitment to attend to, she could wait no longer. She had to return to her home. Before leaving San Giovanni Rotondo, Teresita decided to go to the monastery one last time and wait below the little window where Padre Pio appeared each afternoon to give his blessing to the faithful. Just as Teresita got to the area below Padre Pio’s window, she learned that he had already given his blessing for the day. The little window was closed and locked. “Padre Pio has now retired for the day,” Teresita was told. “He will return again tomorrow afternoon to give his blessing.” About twenty people were still standing below Padre Pio’s window, praying the Rosary together. Teresita decided to stay and pray the Rosary with the group. The little Rosary group continued with their prayers. About ten minutes later, much to everyone’s great surprise, the little window of Padre Pio’s cell opened once again. Padre Pio appeared at the window and looked out on the small group. For the second time that day, he gave his priestly blessing. Afterward, he started waving something in the air. It was not the customary handkerchief that he normally held in his hand each afternoon when he waved to the crowd. It was something much bigger. Teresita looked closely. Padre Pio was waving a bed sheet! The little Rosary group could not believe their eyes. “What on earth is Padre Pio doing?” they said in unison. They began to laugh. But Teresita understood. It was an answer to her petition. It was the “big blessing” she had been praying for. One summer day after visiting the monastery, Teresita was getting ready to walk to town. Without warning, she was suddenly caught in a downpour. Unfortunately, she did not have an umbrella with her. She broke into a run. As she ran toward the town, she felt as though she was in a tunnel. It was raining on both sides of her, but not on her. By the time she got to town, she should have been drenched. But instead, she was completely dry. She had just attended Padre Pio’s Mass and had offered her Holy Communion for his intentions. Teresita knew the privilege that was hers to be able to attend Padre Pio’s Mass. Once, at Padre Pio’s Mass, Teresita felt fortunate to find an excellent seat in the very front of the church. She was able to see Padre Pio clearly. He cried through most of the Mass and he dried his eyes with a white handkerchief that was on the altar. Teresita noticed that the blood from the wounds on his hands had stained the handkerchief. As she looked at the handkerchief, she thought to herself how much she would like to possess it. What a blessing it would be to have a relic of Padre Pio. Several hours later, to her great joy, she was given the handkerchief to keep. A special thank you to Josie Grossi of Montreal, Canada who sent us her testimony through the Send Your Testimony link at our website, www.saintpio.org. A few years ago I was praying to St. Pio and I asked him to send me a sign that he was listening to my prayers. Well, about a week later I received a package in the mail from Italy. The package came from San Giovanni Rotondo. A letter inside the package informed me that I had won the “Epiphany Raffle.” I had never even heard of the Epiphany Raffle. I won books on St. Pio, a number of beautiful photographs of St. Pio, a St. Pio hat and many other St. Pio items. Padre Pio had given me his sign that he was definitely listening to my prayers.